Brittney Corrigan has “carried water” in the fine tradition of her roots, just like the two hundred year old aqueducts in Turin, Italy that were lovingly built by her grandmother’s ancestors. Her opening poem, “Aqueducts,” is our first image in a journey that connects four distinct chapters. Ms. Corrigan’s stalwart collection navigates life in an honest and lucid voice. She takes us places and we go willingly. Navigation takes us places. We feel like welcome guests who’ve been invited to join a family as they inhabit several family homes. We walk through many doors to meet dramatic weather, a stunned bird, nests, islands and one small, first apartment. In amazement we realize how cleverly the narrator has blended her poetic juice with the Portland rain. But it is the poem “Denver’s Rain” that catapults me to the mile high city. Ms. Corrigan describes a gutter in front of her home that, “had a section wide and deep as the bowl of a pelvis, rimmed with asphalt that softened in the heat…” And I was there, right there until she slid me into her mother’s Colorado garden where “my sister and I saved the tumbleweeds for as long as we could…until the snow came and found them huddled there together, curling into each other the way a baby holds on to a thumb.” That’s when I realized I’d been holding my breath. It was as if the poem said, you can breathe now. 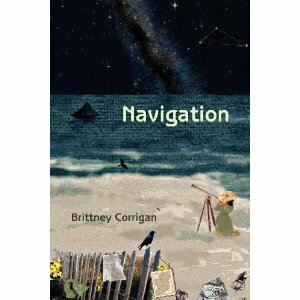 Brittney Corrigan’s Navigation is a deeply moving tribute to home, family, grief, adjustment, motherhood, and adventure. Her poems invite you to see and feel a startling momentum. This book is one for poets and fans of poetry. You will be mesmerized as Navigation takes you by the hand and leads you into the heart of this writer. Thank you, Toni, for the excellent and thoughtful review. Hope you liked my cover design too. Yes, it is lovely. A very nice design to support this exceptional poet! so well described! Everything I loved about Brittney’s book.